In Ngozi Anyanwu’s diaspora drama The Homecoming Queen, Mfoniso Udofia plays Kelechi, a successful writer who has gone back to Nigeria after 15 years in New York. In the U.S. she’s an accomplished adult, but back in Mbaise, she turns touchy and fragile. She grumbles at Papa (a multilayered Oberon K.A. 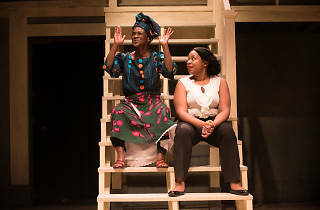 Adjepong), snaps at house girl Beatrice (Mirirai Sithole, exquisitely understated) and stares in bewilderment at her many aunties (a chorus that includes Vinie Burrows and the riveting Patrice Johnson), who have conveniently forgotten why she left. 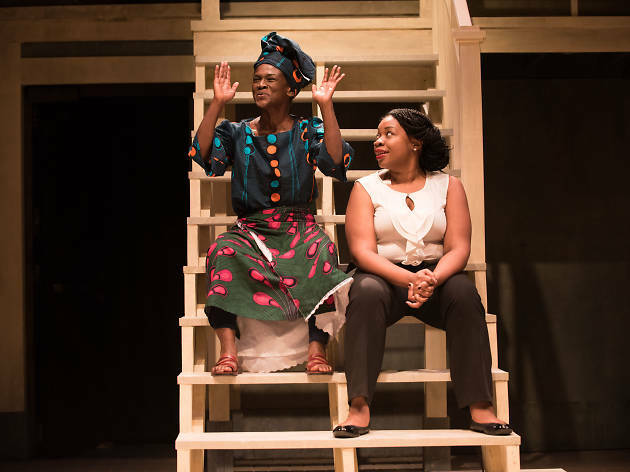 A past trauma has wound Kelechi punishingly tight, and the play ticks along toward a clockwork catharsis that breaks her heart open. Most of the actors seem to be dancing to a tune they hear together, but Udofia is half a step out of pace with them. Perhaps that’s because the character of Kelechi can seem like a piece of wish fulfillment rather than an actual woman in the world, or because Udofia’s performance tips into indulgence. Still, Awoye Timpo’s beautifully constructed production flatters Anyanwu’s work. Where the play is strong—as in the frank and bossy interactions among relatives—the production is excellent; when the writing gets weaker and more predictable, the staging distracts us with sound and celebration. Much, it turns out, can be cured by a vivid sense of place. Designer Yu-Hsuan Chen transforms the little downstairs Atlantic 2 space into a comfortable compound. The walls are washed emerald green and warmed by Oona Curley’s tea-colored light; the bustling chorus members chatter even when they’re not onstage, and when they raise their voices in laughter or song, the room rings. Misgivings about The Homecoming Queen dissolve in the company’s ability to create a palpable community. It’s a homecoming play, after all, and nothing matters more than this sense of welcome. Atlantic Stage 2 (Off Broadway). By Ngozi Anyanwu. Directed by Awoye Timpo. With ensemble cast. Running time: 1hr 45mins. No intermission. Through Feb 11.